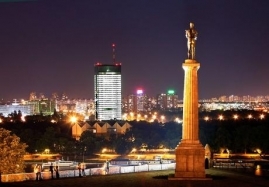 In the near vicinity of Belgrade center are Zemun and River Danube - wide and quiet, illuminated by the tower of Sibinjanin Janko, with cobblestone, riverboat-cafés, restaurants, and boardwalk to Hotel Yugoslavia and the quay where a number of boats go to cruises on Danube and Sava. Zemun developed on three hills, Gardoš, Ćukovac and Kalvarija, on the right bank of the Danube, it developed separately from the Belgrade. Zemun quay is famous for its cafés and fish-food restaurants, and Lido Island on the Danube is a real oasis in summer months where it is also possible to get by boat. Walk through Zemun will give you completely different experience then the other parts of Belgrade, not only considering architecture, but the spirit, atmosphere and river facilities. Its position at the top of Gardos hill provides visitors with a beautiful view back over the town center. From Gardos one also has the broadest panorama of Zemun, and the view of the old city centre nearly has a therapeutic quality. A visit to Gardos and the view of Zemun's roofs and the church bell-towers has many times helped find serenity of soul. This is a charming but small city apartment, perfect for visitors who likes to cuddle up as it is a double bed occupying this flat. On the bright side you will be staying in the middle of city center amongst fashion boutiques, cocktail bars and cafes. Apartament's location is excellent! Near all main sightseeing, 2 minutes from the main street, shops. Very friendly owner! (speaks Russian!). Apartment very nice, comfortable and from the first second I felt like at home. There you can find everything for normal and comfortable life during your station. I like this place very much and with great pleasure will stay there next time! Ready to ask questions. Everything is very well! Excellent location in the center of town.Nice clean and quiet apartment.Very friendly and accommodating staff.Would definitely come back.